The Apollo 60 HP/LP is a Type CE continuous-flow, supplied-air respirator for abrasive blasting, to be used with compressed air systems and ambient air pumps. 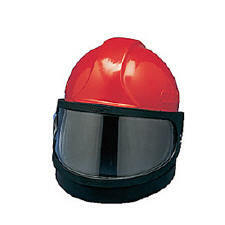 The high visibility red helmet meets ANSI standards for impact protection and OSHA standards for respiratory protection and noise limitations. The Apollo 60’s full-helmet design protects the blast operator’s head from rebounding abrasive and from construction site impact hazards. The heavy-duty waist-length cape protects the operator’s neck, shoulders, and chest from rebounding abrasive.